How we practice medicine in the United States is often dictated by quality metrics established by Medicare and The Joint Commission. Our hospitals often focus on monitoring these publicly reported metrics but there are others that deserve equal attention, even though they are not publicly reported. One of these is the time between when a person presents to the emergency department with a hip fracture to when they have hip fracture surgery. If the hospital’s expectation is that surgery be done immediately, then there is a substantial expense in maintaining an open operating room and on-call pay for the surgeon, anesthesiologist, and OR staff to do emergency surgeries in the middle of the night. On the other hand, if there is an excessive delay, then the mortality rate goes up. One of the most important complications of falls in the elderly is hip fracture. Every year in the United States, there are about 250,000 admissions to the hospital for hip fractures and 90% of hip fractures result from falls. Over a lifetime, 6% of American men will sustain a hip fracture but 14% of post-menopausal women will have a hip fracture. Hip fracture is an important cause of death: when women have a hip fracture, 5% will die within 30 days and 20% will die within a year; when men have a hip fracture, 10% will die within 30 days and 30% will die within a year. About half of patients who have a hip fracture are unable to live independently after their fracture. A study in last month’s JAMA gives us some direction regarding how hospitals should approach the timing of hip fracture repair. The authors examined 42,230 hip fracture patients treated by 522 orthopedic surgeons at 72 hospitals in Ontario from 2009 – 2014. The average age of the patients was 80 years old and 70% of the patients were women. 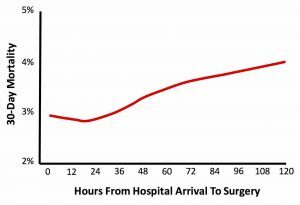 One-third of the patients had surgery within 24 hours of admission and two-thirds had surgery later than 24 hours after admission. The key result was that the mortality rate went up for every hour that surgery was delayed beyond 24 hours from admission to the hospital. Shown in this graph is the 30-day mortality but the 1-year mortality graph had a similar shape (although higher overall mortality rates). The authors further analyzed various complications and found that the percentage of patients having pneumonia, myocardial infarction, deep venous thrombosis, and pulmonary embolism had similar-appearing graphs with the incidence of all of these complications increasing in patients whose surgeries were delayed beyond 24 hours. So, it appears that there is a “sweet spot” in the timing of hip fracture repair. A wait time of up to 24 hours is acceptable but beyond 24 hours, the risk of complications and death steadily increase. 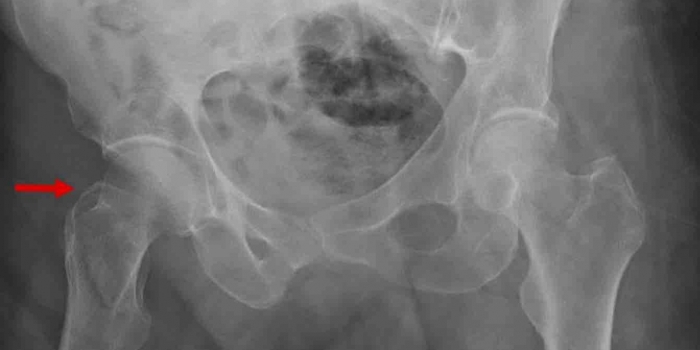 Because patients with hip fracture are elderly and often have serious medical co-morbidities, having at least a few hours to obtain medical consultation, correct major electrolyte abnormalities, identify and treat unstable angina, correct significant anemia, etc. can be useful to improve a patient’s ability to get through a major operation. On the other had, the sooner the patient has surgery, the sooner they can get out of bed to be started in physical therapy and the less likely they are to get complications of being bedridden such as pneumonia and pulmonary embolism. So from the hospital’s perspective, what expectations should we be setting for the management of patients with hip fracture? We need to monitor the time from ER presentation to surgery. 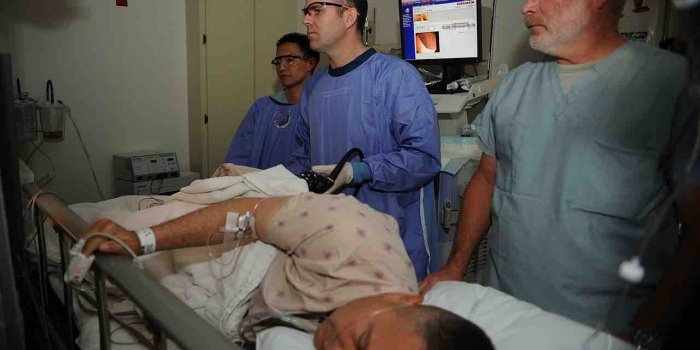 The goal should be for most patients to be operated on within 24 hours of presentation. We need to ensure that we have surgeons, anesthesiologists, and OR staff to do hip fracture surgery seven days per week. Most patients presenting with hip fracture at night can wait to have surgery until the next morning. We need to have availability of medical consultants who can evaluate patients with hip fracture in the first hours of their presentation. We need to set expectations for medical consultants that their evaluation should not delay surgery except in patients with the most serious acute medical problems. 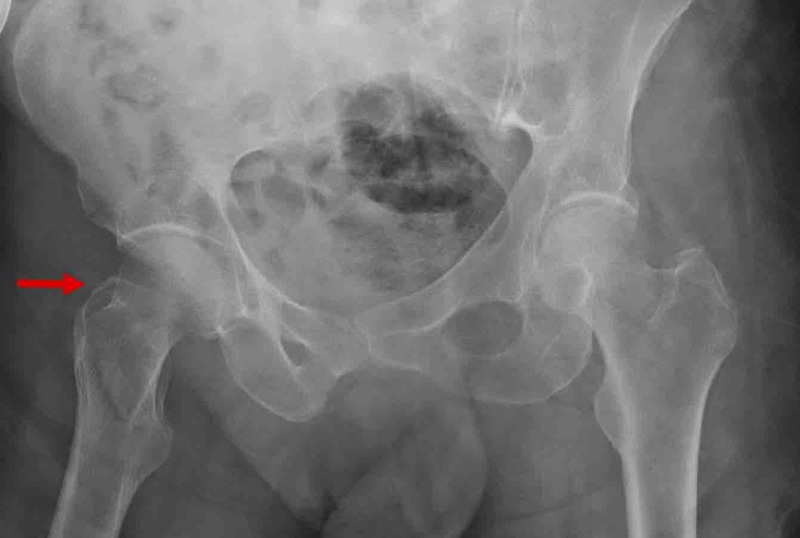 For patients with hip fracture and unstable medical problems such as active gastrointestinal bleeding or unstable angina, we need to have seven day per week availability of testing such as endoscopy and cardiac catheterization or have the ability to transfer patients needing these pre-op tests to another hospital that can do them. We need to have physical therapists available to get patients up and out of bed as soon as possible after surgery – preferably on the same day. This requires having physical therapists available seven days per week. The good news is that the incidence of hip fracture appears to be decreasing. The best way to improve mortality from hip fractures is to prevent the fractures in the first place by reducing geriatric falls. Community programs designed to screen patients at risk for falls, to improve balance and gait by improving physical conditioning in the elderly, to correct vision impairment, to modify the living environment of the elderly, and to identify and eliminate medications contributing to falls are all effective measures to reduce the incidence of geriatric falls. However, even though we may be able to reduce the number of hip fractures, we are not going to be able to eliminate them entirely. We should target a “door to OR time” of < 24 hours for hip fracture just like we target a “door to balloon time” of < 90 minutes for patients with acute myocardial infarction.